1. None of us had ever run the creek before. 2. It's a valley class four run that is so close we just couldn't stand it anymore. 3. Everyone said it is 'worth doing'. 4. We're not too bright. On this particular trip I was joined by James Bagley Jr., Jesse Coombs, Michael Long, and Pete Giordano. We drove up to the put-in and noted that in spite of the local yahoos best efforts to shoot the gate to pieces, it was still standing strong. After absorbing this unfortunate bit of bad luck for a minute or two, we started getting ready. Pete whipped out his ever-so-amazing homemade boat-backpack/catapult system (it slices! it dices! it tenderizes over great distances!) and I dug out my salamander pack. Meanwhile, Mike and James listened as Jesse told them how to rig up all kinds of commando pack systems with straps, slings, and pads perfected in far off regions of the world (Jesse had just returned from an epic 45-day South American kayaking trip, so he was practically bursting with tips, tricks, and stories... "..and then I ended up in an undercut below the 45-footer!!.."). Once he was finished dispensing with valuable advice, Jesse sat back to watch the rest of us wrestle with our cumbersome creekboats while he practiced rubbing his stomach and standing on one foot while balancing his one-pound playboat on the tip of his index finger. "Check it out guys, check it out!! Eyes closed, even.. EYES CLOSED!!" Finally, we were all more or less ready, and James and I took off down the road at a very high rate of speed to run the shuttle. As we blazed over one of the last hills, I spotted a pair of headlights with boats on top approaching rapidly. "Hmm. where in the heck do they think THEY'RE going?" I muttered to myself. "They're gonna be mighty disappointed when they see that gate!" But, as they got closer, I shouldn't have been surprised that I recognized the rig, and when Gabe Flock and Steve Stuckmeyer of Eugene pulled along side we all had a pretty good laugh.. at ourselves. "The gate's closed." Gabe said, not a question. "Yeah." I said, grinning. "But we're gonna hike it." Gabe rolled his eyes. "We ran into a gate on Crabtree and figured we'd try our luck here." "Lucky you." I said. "Shoot, join the crowd, counting you guys we've got seven.."
Back at the gate, we got all boated-up and headed off down the road. The creek runs fairly close by, and if you walk it every major rapid is visible on the way up. This was actually kind of nice, because it limited the amount of scouting we had to do once on the creek. (It also helped that Steve and Gabe have both done Wiley five or six times). Gabe Flock (foreground) begins the 2.5 mile hike to the put-in on Wiley Creek. Finally we reached the put-in just above the first major rapid known as Ricochet and James was dismayed to discover a drag-induced hole in the bottom of his Salto. No problem, that's what Duct Tape and pin kits are for. In no time we had assembled an impressive array of tools, tape, foam, and hot air for the job. We had the seat out in a snap and slapped on an impressive mound of duct tape on the spot. "That'll hold er' six months, easy!" I said, proudly surveying our handiwork. James Bagley, Michael Long, and Jesse Coombs with James' newly patched boat..
We hiked down to the creek and headed downstream. 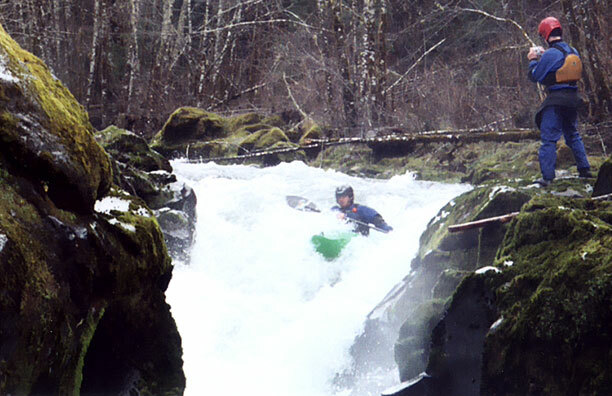 Most of us got out to scout Ricochet, which is the most intimidating rapid in the creek. While the rest of us were scouting, Jesse decided it 'looked good' and ran it without getting out of his boat. 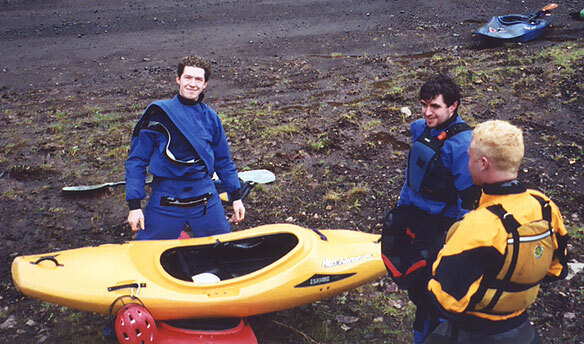 I call this the 'scouting while five feet under water' method of running rapids. Of course, Jesse popped out at the bottom ok, and then Michael Long decided to give it a go and did just fine. 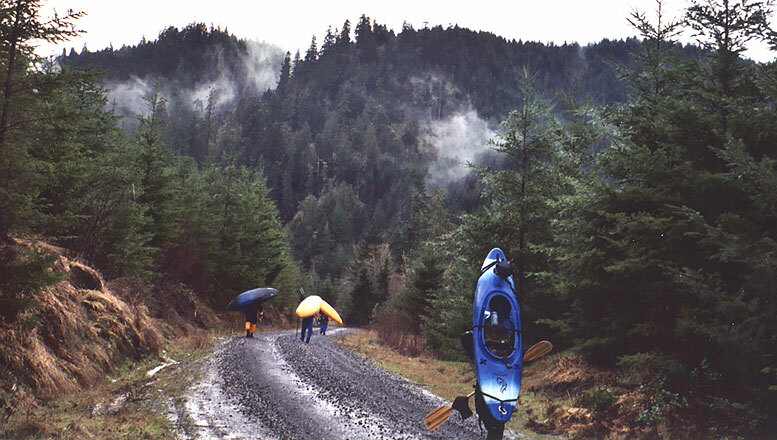 After contemplating the narrow, pinny confines of the drop, the rest of us portaged. While we were doing that, Jesse hiked up and ran it again..
Michael Long drops into the narrow confines of Ricochet while James looks on. Below Ricochet the creek took off through a long series of very fun class III-IV rapids. 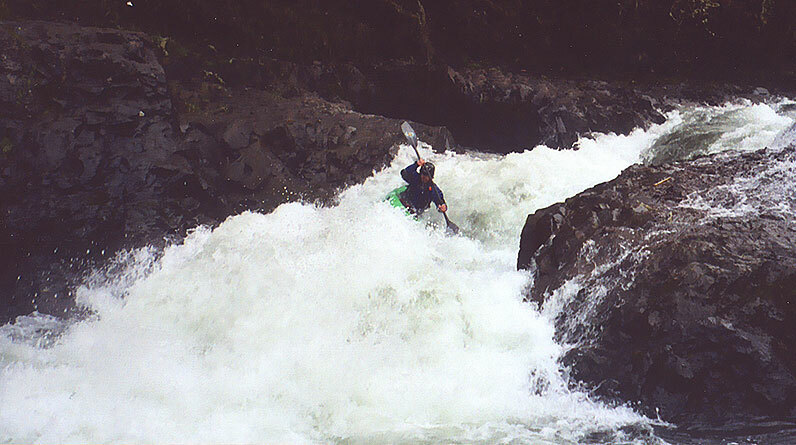 The whitewater was very continuous and fun, reminding me of an easier version of Upper Quartzville. Jesse Coombs lines up on a twisty ledge-drop while Michael waits in the eddy upstream. Soon we arrived at the next big drop, known as 'Taint Natural'. Unfortunately the main left entrance (where all the water goes) was blocked by another annoying alder, but fortunately Jesse was able to paddle down, hop out, and hold the log up for everyone to duck under. Gabe went first, then Steve, and both did well. Gabe went on the river-right side down the main double drop, while Steve braved the munchy triple drop on river-left. Michael fired off the right side, then I followed Michael and got out to shoot photos. James and Pete also ran right, then that left Jesse. Now, there was nobody to hold the log up for Jesse, so we all assumed that he would hike around the log and run the rapid. He then ran the left side (bigger holes over there..), no problems. Mike watches Jesse run the bottom part of Taint Natural. The log Jesse went under is visible blocking the river-left channel.. he went 'under' it on that side..
Downstream the rapids gradually tapered off to a mile or so of very boring class two rapids, almost enough to kill the buzz from the upper, 160 fpm section. We all agreed that more water would help speed this section along a bit, but everything got better when we arrived at the next major rapid, Cascade Falls. 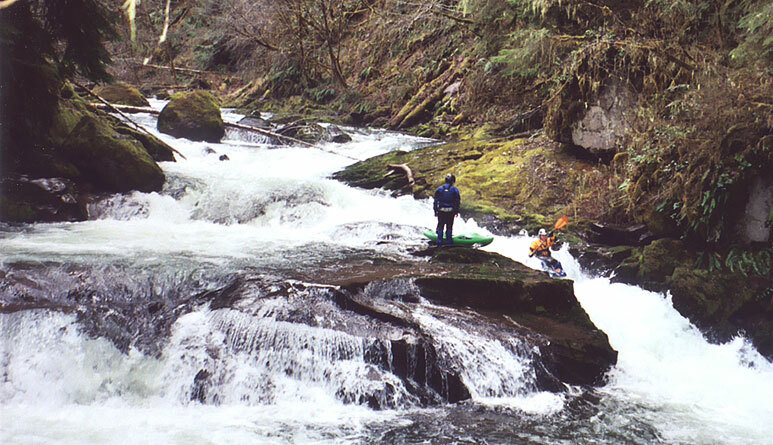 Cascade is my favorite rapid on Wiley Creek; this rapid is actually located below the gate, so it is always accessible to paddlers. A few years back we were stymied by the gate once again so we spent a few hours at Cascade, running it 10-15 times each, which was pretty darned fun! 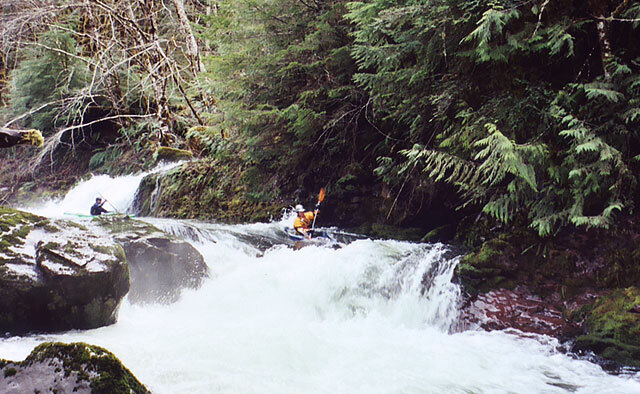 Cascade drops down through two big, munchy holes, and is one of the highlights of any run down Wiley Creek. Below Cascade the creek is actually surprisingly fun for the last mile or so, with four or five really nice ledge drops and slides. None of these drops are as big as Cascade, but they are all pretty fun.. Most of the major drops are visible on the road. The gate is usually open until Thanksgiving, so catch an early rain and enjoy this one without the hike. We put in where road 230 takes off up to the left, just above Ricochet. Ricochet is clearly visible from the road, so if you aren't interested in this one, put in below it.